I forgot to mention this (so much other stuff on my mind...like pondering how my tiny newborn got suddenly so substantial), but I started a monthly column in Practical Parenting magazine. The November issue has the first column - but I think the December issue is already on sale! I never even got to see the November one. December's has ideas for a more sustainable gift list (and one that won't break the bank). 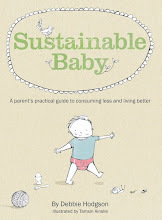 Good one on Sustainable Baby - it helps a lot! We clearly share similar parenting experiences and views. I've been reading one that I'm hooked on - http://todayscliche.com/. I have a feeling you'd get a lot out of it. Incredible job on your blog; keep it up. I have asked the magazine editor to send me a copy, so I should be good. Thanks! I'm glad you like the column - the next one will be on natural first aid.